I just finished reading this collection of The Thing's adventures against Project Pegasus from Marvel Two-In-One and I came to a conclusion: Marvel is good at starting epics and not so good at finishing them. Well, "epic" is probably too generous a word for this collection as the series is not that ambitious. And, unlike some other runs from 1978 - 1979 that I've read in reprints, I had almost all of these issues as a kid when they were new in 1979 or so. The script by Mark Gruenwald and Ralph Macchio (not that Ralph Macchio) is good and the art from George Perez and others is decent. As The Thing is probably my favorite comic book character of them all, it was quite fun to see him completely cut-off from the Fantastic Four here. 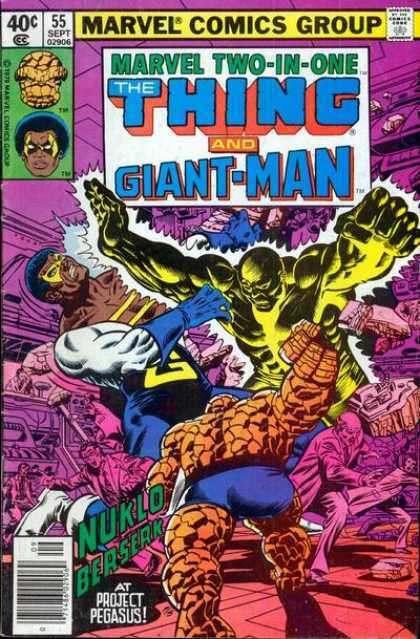 And some of the costars -- Captain America and Black Goliath, especially -- are worthy partners. I wonder if this was a test run for a possible Thing solo series?